Starting a new research project means learning a new language. In the beginning of a project especially, deciphering what the heck people are even talking about can be quite challenging. Case in point: Right now, I’m just starting to collect data  on Republican efforts to dismantle the Affordable Care Act (ACA), and I’m struggling up a steep learning curve trying to “speak Repeal and Replace.” I don’t know the jargon. I am not a “policy wonk.” I don’t understand all the intricacies of health care and congressional procedure. I’m still getting a handle on what the Senate plan and the prior version of the bill would do. I’m not even sure what hashtag to use. First we were talking about the American Health Care Act, so I was using #AHCA. Then I read it’s been renamed the Better Health Care Act, so I started using #BHCA. But now I’m seeing #BCRA on Twitter, so I looked that up and found out it stands for Better Care Reconciliation Act. Ironically enough, BCRA is also an acronym for a gene for breast cancer. So I guess that’s what we’re calling it now? #BCRA it is, then. We can raise breast cancer awareness, protest, and bask in the poetic justice of an ill-conceived acronym for an ill-conceived plan. Win, win, win. While I’m trying to get a handle on the language of Repeal and Replace, I’m also working to identify common sense notions about health care reform on the right. The ideas that are generally shared by people who want to “repeal and replace Obamacare” are evident in their communication. Major themes, linguistic and ideological touchstones that come up again and again in arguments in favor of dismantling the ACA–these are discursive elements that reveal group members’ common sense, their shared beliefs, attitudes, and sense of identity. Until I started this new research project, I remained adamantly ignorant of the beliefs of those in favor of dismantling the ACA. I’ve followed the health care debate closely for months, but I generally — deliberately — avoided discourse I didn’t agree with. I concentrated my attention on learning about and opposing Repeal and Replace legislation, and I ignored right-wing perspectives. However, I’ve come to realize that I can’t effectively counter anti-ACA arguments unless I understand them better. So now I’m playing catch up. Right now, I’m focusing on the following turns of phrase, and I’m only beginning to tease out what exactly they mean. Shift power back to the States/Americans. I don’t really know what these slogans stand for, what associations they call up, or how these points are argued in pro-#AHCA/#BCRA discourse. So, I’m cataloguing references to these catchphrases and analyzing artifacts that will help me to figure out what they mean. Currently, I’ve got more questions than answers. 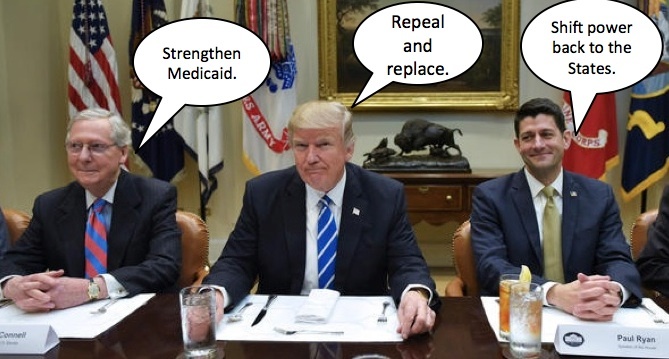 Repeal and replace (R&R) is, of course, ubiquitous, and used by Republican politicians and many media outlets and organizations both for and against GOP health care reform. Surprisingly, the White House seems to agree with ACA supporters that a lack of access to healthcare coverage is a problem. An infographic stresses that “nearly 30 million Americans [are] still without healthcare coverage” and laments recent drops in enrollment. And several headlines in the “Obamacare failures in the news” section point to Americans’ lack of access to health insurance. Indeed, it is a Bad Thing that millions of Americans don’t have healthcare coverage and that so many lack access to insurance. But these problems would be made worse by the #BCRA, which would increase the number of uninsured Americans by 22 million and lead to drops in enrollment. How do proponents of Repeal and Replace reconcile the idea that people lacking coverage is bad with the fact that this legislation would cause people to lose coverage? I need to investigate the claim that the ACA is a “disaster,” that it’s “collapsing.” Who are the “victims” of Obamacare pictured in a “listening session” with Health and Human Services Secretary Tom Price and spotlighted in the “Stories from victims of Obamacare” section? What kinds of stories are shared on the White House site? What are the reasons behind insurance companies pulling out of state marketplaces–a theme addressed by two links in the “Obamacare failures in the news” section? “Strengthen Medicaid” co-occurs with the phrase “the most vulnerable” in several of the links I’ve searched up so far, as in “Strengthening Medicaid and prioritizing the most vulnerable” and “Working together to strengthen Medicaid for the most vulnerable.” Who are the “most vulnerable,” according to ACA opponents? How do their characterizations of the “vulnerable” people served by Medicaid differ from depictions of Medicaid recipients in recent protests to #SaveMedicaid? How does cutting Medicaid help “the most vulnerable,” according to BCRA proponents? There is a strong anti-fraud sentiment and frequent reference to “fraudsters” in strengthen Medicaid discourse. Who are these fraudsters? What is the actual prevalence of fraud within Medicaid? How would cuts to Medicaid reduce fraud? Shift power back to the States/Americans is the least snappy of all the slogans I’ve collected so far. The idea that Repeal and Replace initiatives will “shift power to States” is something that Paul Ryan has talked about a lot, and Mitch McConnell’s argument that the GOP’s healthcare legislation will give “Americans more power to control and reduce their medical costs” is a kind of “shift power to Americans” argument. I need to investigate this notion of power more. If power is shifting, where is it shifting from? The federal government? Why do BCRA proponents argue that it’s more desirable for states and individuals to have more power relative to the federal government? What kind of power are we talking about? Giving states the power to deny essential benefits and forcing them to accept responsibility for a higher percentage of Medicaid costs? Giving Americans the power to utilize tax-free accounts to pay for increased out-of-pocket costs? The GOP has abandoned the vote on ACA repeal for now in light of a scathing Congressional Budget Office report, widespread protests by disabled activists, and an influx of phone calls from concerned citizens. On one hand, I am relieved that the vote wasn’t pushed through. On the other, I don’t want to lose momentum. I feel like I have to maintain my sense of urgency with regard to this research, just as we in opposition need to keep pushing to stop this bill. #BRCA vote is delayed until after Congress' recess. Data = examples of communication in use. Right now my data collection is predominantly online. I’m archiving a lot of web pages, social media posts, online newspaper articles and news broadcast clips, press conferences, political speeches..
 Noticings = things I’m noticing about the data.